As the ongoing Kampala Peace Talks potentially wind to an end, it has become clear that a broader and more inclusive regional peace process is vital to address core drivers of conflict in Congo, particularly along its eastern borders. 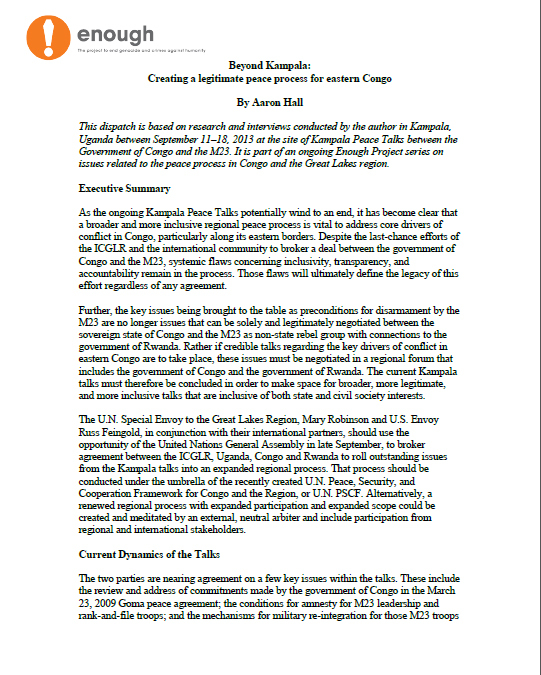 Despite the last-chance efforts of the ICGLR and the international community to broker a deal between the government of Congo and the M23, systemic flaws concerning inclusivity, transparency, and accountability remain in the process. Those flaws will ultimately define the legacy of this effort regardless of any agreement. Further, the key issues being brought to the table as preconditions for disarmament by the M23 are no longer issues that can be solely and legitimately negotiated between the sovereign state of Congo and the M23 as non-state rebel group with connections to the government of Rwanda. Rather if credible talks regarding the key drivers of conflict in eastern Congo are to take place, these issues must be negotiated in a regional forum that includes the government of Congo and the government of Rwanda. The current Kampala talks must therefore be concluded in order to make space for broader, more legitimate, and more inclusive talks that are inclusive of both state and civil society interests. The U.N. Special Envoy to the Great Lakes Region, Mary Robinson and U.S. Envoy Russ Feingold, in conjunction with their international partners, should use the opportunity of the United Nations General Assembly in late September, to broker agreement between the ICGLR, Uganda, Congo and Rwanda to roll outstanding issues from the Kampala talks into an expanded regional process. That process should be conducted under the umbrella of the recently created U.N. Peace, Security, and Cooperation Framework for Congo and the Region, or U.N. PSCF. Alternatively, a renewed regional process with expanded participation and expanded scope could be created and meditated by an external, neutral arbiter and include participation from regional and international stakeholders.